It’s never been so easy for the people of Copenhagen to go to the beach. And go they do. In huge numbers. Amager Beach Park has become one of the city’s hubs of activity in the summer season, but there’s activity here all year round. Just five kilometres from City Hall Square, and with three Metro stations almost on the dunes, Copenhagen’s big beach offers something for everyone, no matter their age. In its present form, the beach isn’t even 10 years old yet, but it’s already difficult to imagine Copenhagen without it. This is not the beach to find peace and quiet on a hot summer’s day, unless you arrive very early in the morning. In the high season, people flock here to swim, sunbathe, run, cycle, sail, kayak, snorkel, try out the underwater activity pitch, windsurf, kite-surf, picnic, paddle, build sandcastles, people-watch, rollerblade, play beach volleyball, lift weights and much, much more. Fortunately, the beach is big enough to accommodate all of these activities. 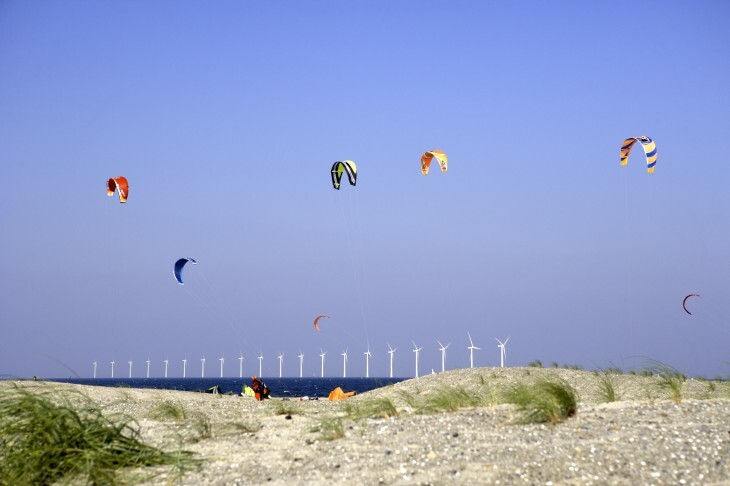 Like Køge Bay Beach, its big brother to the south, Amager Beach Park was created by building a new beach further out from the original shoreline, creating both open beach and protected, kid-friendly lagoons. The Helgoland Baths were also rebuilt in a new but familiar form. The old popular gathering points, Femøren and Tiøren, look the same as ever, full of life and activity, and continue to host concerts. On summer evenings, the atmosphere is quite Mediterranean, with large groups of families and young people gathering to eat and enjoy themselves until long after the first stars appear in the sky. Swimming, relaxation, running, rollerblading, ball games, diving, underwater activity courses, snorkelling, windsurfing, kite-surfing, kayaking, sailing. Picnics, barbecues, sunbathing, hiking, play areas for children, concerts, sporting events. Dogs are allowed on the beach, but only on a leash – and during the bathing season, only on designated paths. There is an area just north of the beach where dogs are allowed to run free. Outside the bathing season, fishing is allowed throughout most of the area. The area was originally swampy, shallow water. It was gradually reclaimed, and the first Amager Beach opened in 1933. The idea of improving the beach was suggested as part of the Metro project. In 2005, the new Amager Beach opened for the first time. Femøren and Tiøren were named after old Danish coins. One explanation for this is that people used to come here to dance, and the entrance fee was Femøren (the five-øre coin). Tiøren (the ten-øre coin) got its name simply because it is larger than Femøren. A rich underwater environment has developed in the lagoon, teeming with plants and fish. Some birds have found their way here, and a few hares roam the hinterland. But above all, it is the activities that attract the crowds. The beach is suitable for disabled people. Cafés and ice cream stalls.